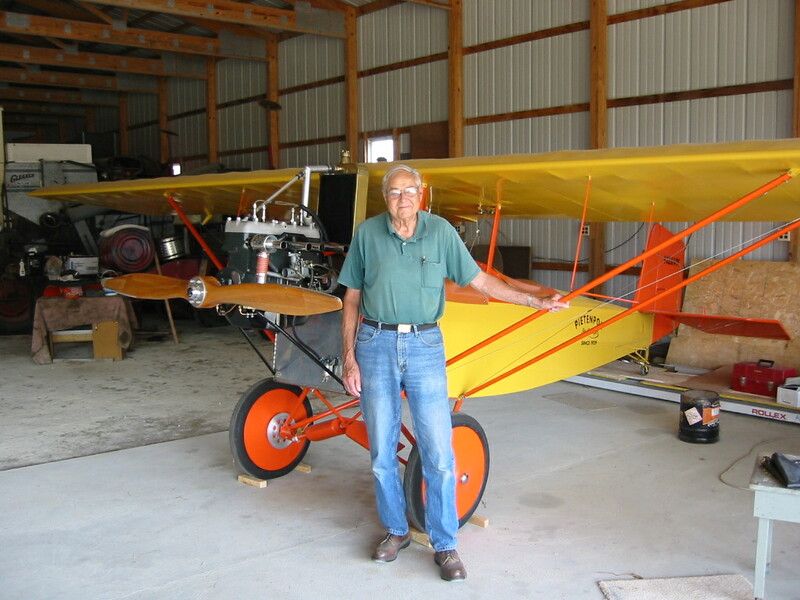 Devoted Minnesota aviator John Schmidt sent word that, Vi Kapler, the strongest living personal connection to the life’s work of Bernard Pietenpol, passed from earth last night. A very rich book of memories, knowledge, and understanding has been closed, never to be opened again. If you are a Pietenpol builder, a fan of the life of BHP, or fascinated by early homebuilding, it is hard overstate what has slipped from our grasp. I was fortunate to have spent a number of hours with the man, in person, listening to what he knew and thought. He was kind and humble. I borrowed the photos below from several websites, to remind Piet builders of what he looked like. This is important, because he surely had countless conversations with builders at Brodhead, and perhaps half of them didn’t understand that they were speaking with Vi Kapler. He was the kind of guy who could share something with a new builder without needing to be pre-understood as the living authority on Pietenpols. Vi’s list of contributions to Pietenpol building is very long, but I treasured most the fact that he had worked for many years, side by side with Bernard Pietenpol, and you could ask him almost anything about the experience and he was glad to share it. The stories most people tell about working with people understood to be famous or legends tend to get polished with every re-telling, until become something of a caricature rather than a sharp photo. The things Vi shared were just the opposite, they all had a real grit and grain to them which gave you the feeling that it happened yesterday. You were left with the feeling you had just be given a real look at how it was, and how it will never quite be again. Blue skies and tailwinds Vi, thank you for leaving aviation a richer place than you found it. -ww. 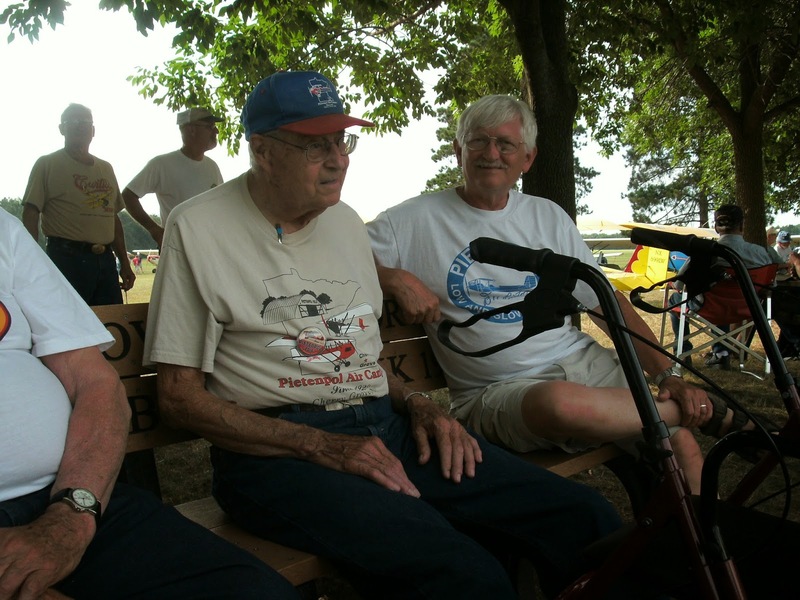 At the 2013 Brodhead Pietenpol fly-in, Vi with a cane, looks at Pat and Mary Hoyt’s Zenith. Vi made many parts for Corvairs in the 1970s and 80s. Above, in the blue hat, sitting on the bench at Brodhead. I used to call BHP ‘Bernie” in my writing. I can tell you the exact minute I stopped this. I was speaking with Vi Kappler at Brodhead, in the MacDonald’s in town. It was early in the morning on Saturday, about 10 years ago. Listening to Vi, he was speaking of a man who was not an aviation legend, but a dear personal friend, who was gone. When Vi said the name ‘Bernie’, it suddenly struck me as private, sacred and something that was not mine to use in Vi’s presence. BHP, was my hero, but he was Vi’s friend, and to use the familiar name in Vi’s presence seemed very wrong. I stopped right there, and have written ‘Bernard’ ever since, because I never wanted to imply I was friends with the man, especially not to anyone who really was. 3 Responses to Vi Kapler passes from this Earth, age 88. Most of what I know about Vi I heard from someone else, he was not one to toot his own horn. I am privileged to have a distributer hold down clamp and a fat harmonic balancer washer on my engine that were gifts from Vi. I will remember him waving his long arm out of the cockpit of his Piet. I imagine you will remember him when truing heads with his Corvair tool. EAA Chapter 100 will miss him. Vi Kapler will, of course, be missed. The few times we talked at Brodhead are great memories. Like so many of his generation humility and honesty always shone through. He knew and lived the Pietenpol experience with BHP; as good as it gets. I feel fortunate to be able to participate. It is indeed sobering news. As Ray mentioned, I am glad to have been able to continue some of what Vi has done for the Piet community, but it’s just a small part of who he is and what he has meant to so many, for so long. It was not that long ago that I spoke with him on the phone on a Saturday morning (it was afternoon, where he is), and discussed taking over the manufacture and sale of tail hinge parts for Air Campers. Little did I know what I would get from him a couple of weeks later, well packed in a recycled moving box. I expected to get a shoebox sized package with some leftover casting blanks and maybe a jig or two because he said he had some castings that he had rejected but that would be good for me to practice on. I was wrong. In the box were many hand-made (and well worn) tools and jigs that he used to make the hinges over the years, and each of them had an index card taped to it with handwritten notes on how he used each item and in what sequence. He included samples of the recommended hinge pins, AN screws, and representative parts in process. All with hand-written notes on index cards. He included a cutoff saw that he used to face off the hinge tabs, a machinist’s vise that he used to clamp the hinge halves for drilling, and a wheel to mount adhesive-backed emery material to true up the bottom and sides. I have kept all of the handwritten notes, parts, and everything else. It all means something to me. When I discussed a price for acquiring the rights and the “tooling”, Vi went quiet on the phone for more than just a few seconds and I thought maybe he was conferring with a family member about it or something, but he was thinking. I expected some lawyer talk and a discussion of liability, forms, and negotiations. I was wrong. “Well, I guess I would let you have it all for $100. Or maybe less.” He spent more than that on what he sent me on the box plus the cost of shipping it to me. When he said that it was my turn to fall silent on my end. I was flabbergasted. Then we discussed why he had stopped making the parts and why he was glad that someone would be taking over the production of the parts. That has been my only personal contact with Vi Kapler, but it was enough. He has lived his life the way I want to live the rest of mine, and for the same reasons.